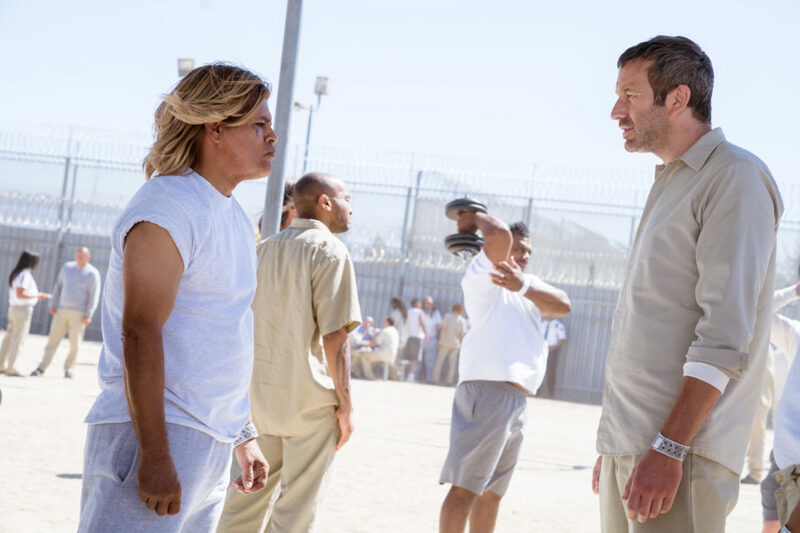 Miles (Chris O' Dowd) must make a deal with Swayze (Raymond Cruz) in the clink via Get Shorty's Season 2 finale, "Pickle." If the first season of Get Shorty on Epix was a slight detour from the original source material, then Season 2 is a straight-up exit from Elmore Leonard’s roadmap (that’s not a bad thing). And as the season finale wraps, questions remain about what could possibly be next for this must-see series? We can only hope there WILL be a Season 3! There’s more than a few obstacles for Miles and his crew as he fully adjusts from gangster to movie producer. Blackmail, money laundering, violence, dead bodies, mental games… nothing is off limits when it comes to getting a movie made. Everyone’s getting pulled into different directions and there’s currently no clear-cut destination for any of them. Rick Moreweather (Ray Romano) transitioned from a scared pawn in Amara’s big plans to an FBI informant… and later, he became her husband. Louis (Sean Bridgers) went from mobster to screenwriting poser to proud papa. Katie (Lucy Walters) has moved on from threatening to divorce Miles… to finalizing the deed and later getting engaged. April (Megan Stevenson) went from producer to unemployment, back to producing Miles’ dream movie… and finally standing up for herself. Gladys (Sarah Stiles) went from being unemployed and pregnant to motherhood and working for April. Amara (Lidia Porto) went from working with the enemy (the L.A. cartel) to fleeing the country. All of this pales in comparison to Miles’ (Chris O’Dowd) journeys, as he’s done his best to hold onto his sanity while trying to get a movie off the ground, fending off the FBI and later going to prison after the deal he agreed to was rescinded by the feds. Get Shorty is still a great behind-the-scenes showbiz satire and it seems like working in Hollywood is just like being in an asylum or even a prison. There’s no set of instructions for these characters to follow. Whatever the obstacle, Miles makes it work. Multiple topics are explored throughout the year, including Hollywood and the addictions of filmmakers. Backchannels and love triangles. There’s even body mutilation used to garner a few laughs (mission accomplished). Multiple floating storylines, much like Arrested Development, can get complex, to say the least. Unfortunately, Ed (Isaac Keys) and Gladys (Stiles) didn’t have a whole lot to do in Season 2. Hopefully, these great actors, along with April (Stevenson), will get more opportunities in the next season. Special Agent Clara Dillard (Felicity Huffman) is very good at getting everything she wants within the Bureau, including controlling others, kind of a yin to Amara’s mob boss yang. With that being said, Miles and Studio Exec Lawrence Budd (Stephen Weber with a follicle problem) are also very similar, they just get things done differently (violence vs. non violence). By the end of the season, these opposing forces were so similar, it’s ridiculous. For non-subscribers to Epix, now there’s an easier way to watch this genius series! Netflix is currently airing Season 1! I WANT MORE EPIX ORIGINAL SERIES LIKE GET SHORTY! 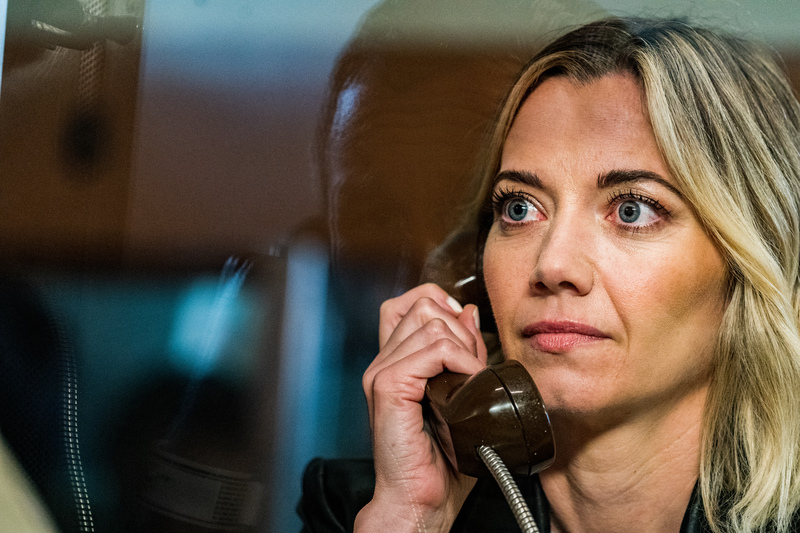 Megan Stevenson is absolutely NOT phoning it in on Get Shorty‘s Season 2.